Over 30 years ago, NASA found that potted plants could absorb air contaminants inside space vessels. More recently, a growing body of research is supporting the important role plants play in removing a major class of indoor air contaminants called volatile organic compounds, or VOCs. This groundbreaking evidence has particular relevance to our work environments: our long working hours, spent inside buildings where we’re exposed to VOCs all day, are making us sick—but indoor plants have the power to combat this effect. Eighty percent of Australians live in cities. On average, these urban dwellers spend 90 percent of their time indoors, where the air is actually more polluted than outdoors—a fact so shocking that it may be hard to believe. Indoor air contamination comes from printers, copiers, furniture, flooring, cleaners, and other materials that give off harmful chemicals. It takes only very low concentrations of these VOCs to cause or contribute to Sick Building Syndrome (also called SBS, or building-related illness). Signs of Sick Building Syndrome include headaches, allergic responses, breathing problems, fatigue, and even serious illnesses. In short, Sick Building Syndrome results in increased employee complaints, sick days, and turnover, and decreased morale, quality, and productivity. People aren’t meant to be trapped inside all day. But just because workers have to do their jobs in indoor offices all day doesn’t mean they need to suffer from the effects of SBS. 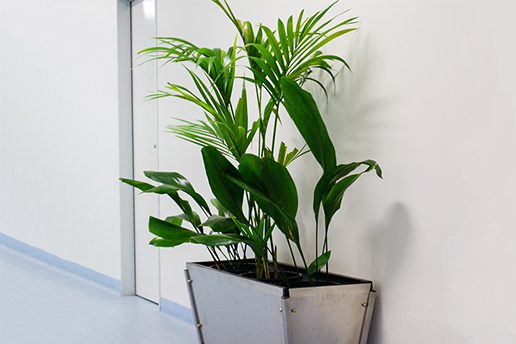 There’s a cost-effective and simple solution to the health risks of modern working conditions: the humble indoor plant. There’s a growing body of research documenting the natural ability of plants—almost any species, in fact—to absorb toxins from the air inside densely populated buildings. A major contributor to this evidence is Margaret Burchett, and fellow researchers, at the University of Technology, Sydney (UTS), who have found that potted plants can substantially improve the quality of indoor air. Their research found that plants can eliminate high airborne concentrations of VOCs by up to 70 percent within 24 hours. In addition, researchers found that the plants are equally effective during the day and at night, and in buildings with or without air conditioning. 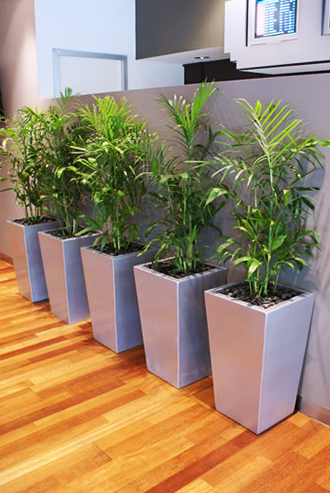 The plants start filtering the air when VOCs rise above a certain level. That means they’re self-regulating—no one has to turn them on or off. Plants accomplish this remarkable feat through a symbiotic process involving the plants, soil, and microorganisms. The microorganisms in the potting mix are primarily responsible for removing the VOCs. The plants nourish the microorganisms in the root zone. Because this is a symbiotic, therefore mutually beneficial, relationship it can continue indefinitely. That means the ability of the plants to eliminate VOCs from the air does not expire as long as the plants remain healthy: they’re an inexpensive, low-maintenance, and never-ending source of fresh air and vitality. The first benefit for building and business owners is the low impact on their bottom line. There’s no man-made device that could achieve what plants do naturally—and certainly none that could invigorate an indoor space with the same pleasing visual effects that plants bring. It’s inexpensive to incorporate live plants into our buildings; but the financial benefits of improving the indoor air quality are immense. For their small outlay, business owners reap the benefits of improved kerb appeal, higher employee recruitment and retention, and increased customer satisfaction. 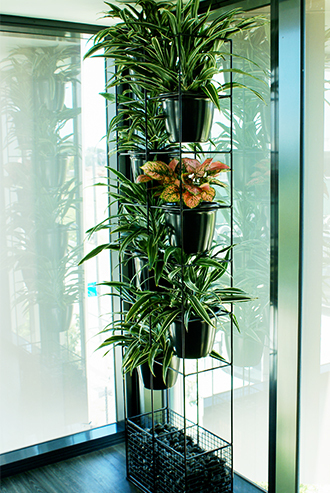 The UTS researchers discovered another surprising fact: that just a small number of plants can accomplish the desired results for indoor air filtration. 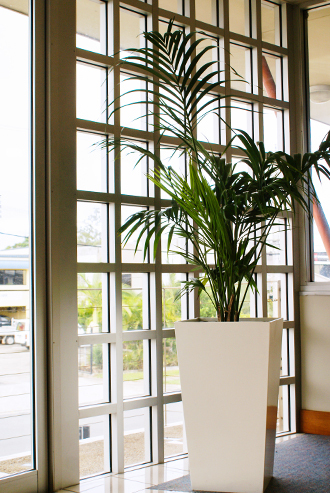 The researchers found that plants can be used to complement, and perhaps replace, mechanical filtration systems in any type of indoor environment—with the minimal expense of investing in just a very few plants. The financial benefits are obviously measurable in terms of reduced sick leave, improved morale and productivity, and longer retention among staff. But they’re also potentially evident in the protective factors of plants: while we still don’t fully understand the long-term effects that VOCs have on our indoor workers, we’ve had a glimpse of the serious and morbid health risks they can potentially cause—risks that business owners can easily play a role in reducing. 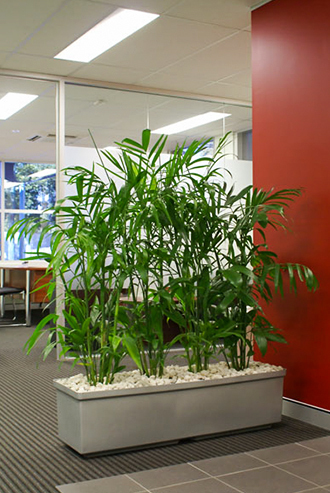 By incorporating live plants in their offices, business owners can improve the working conditions and quality of life of their employees in the short term, as well as potentially reduce their long-term risk of cancer and other diseases related to toxin exposure. The best part about using plants to purify indoor air is how easy it is. 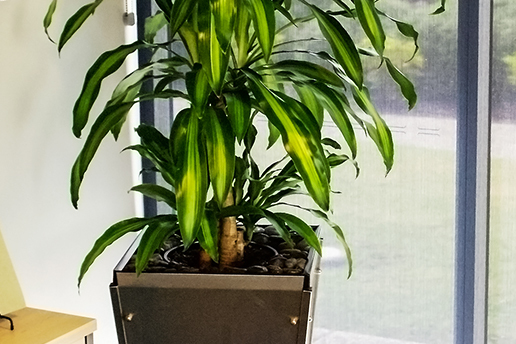 Virtually any old plant will contribute to fresher, cleaner air in your office, and most varieties will need very little attention from you to keep doing what they do best over the long term. There are, however, certain types of plants that are more conducive to removing toxins like formaldehyde, benzene, and carbon monoxide from the air. Palm varieties, like the Areca Palm and the Lady Palm, are adept in dealing with these toxins. Varieties from the Marantaceae family, like Calathea Insignis, are also ideal for removing VOCs from synthetic products, while providing a striking visual effect with their large, ornamental leaves. 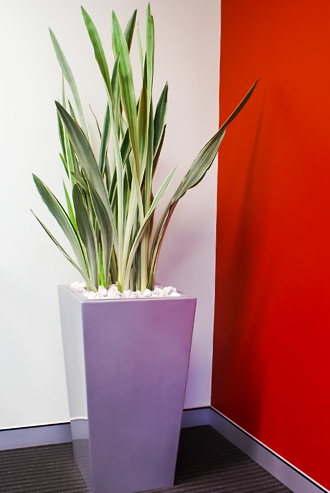 Indoor plants are a portable, inexpensive, and low-maintenance tool for measurably improving the quality of your office’s indoor air. But with the right expertise, you can not only achieve a greener, healthier atmosphere for your employees, but you can transform your workplace into a visual feast of designer greenery. At Prestigious Plantscapes, our fully trained plant designers are skilled in determining the best varieties to achieve clean air in your building, where to position them to get the most benefit from their natural ability, and how to arrange them to achieve a striking aesthetic that will really bring out the best in your brand. 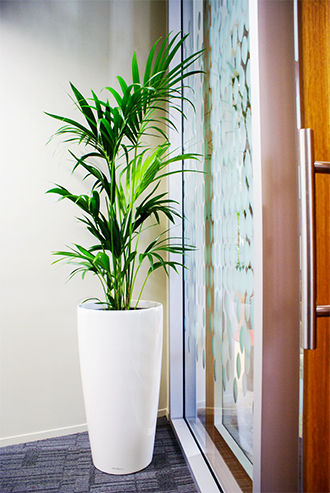 Contact us any time to find out more about how indoor plants can benefit the health and wealth of your business, and our expert plantscapers will be happy to help you move it into a greener future.